Independent New York television station CUNY TV has been educating and informing city viewers for more than three decades. Its cable distribution in the city’s five boroughs is enhanced by digital broadcast on Channel 25.3, expanding its reach in the tri-state area to a 35-mile radius from Times Square. This advance – enabling the station to more than quadruple its potential television audience from nearly 1.7 million cable households in New York City to 7.3 million broadcast households in the New York metro area – is made possible by the merging of technical operations with NYC Media’s WNYE/Ch. 25 at CUNY TV’s headquarters at Fifth Avenue and 34th Street in the City University of New York Graduate Center. CUNY TV continues to be cablecast on Ch. 75 (Spectrum and Cablevision/Optimum Brooklyn), Ch. 77 (RCN) and Ch. 30 (Verizon). Established in 1985 the station has steadily increased its ambition and scope, in 2009 becoming a full-capacity HD studio and post-production facility, with a six-camera mobile production truck. CUNY TV is overseen by Interim Executive Director Gail Yancosek, a 10 year CUNY veteran and a 40 year veteran of commercial television production. CUNY TV’s expanded reach includes an enhanced commitment to community broadcasting, while maintaining a consistent link to its roots in lifelong learning. CUNY TV is the recipient of 18 New York Emmy® Awards, and other prestigious industry honors including the Telly Award and Communicator Awards, and more than 89 NY Emmy nominations. 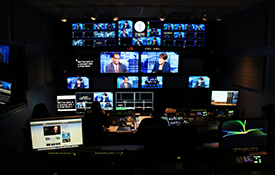 More than a thousand hours of CUNY TV’s original programming also are archived online for national and international access at www.tv.cuny.edu. We encourage you to browse our site to get to know our schedule, series, specials, and archive. Please send your questions or comments to us using this form.